Android's Big in North Korea? First Look at the Country's New Tablet. North Korea doesn't exactly scream cutting edge or progress or freedom or delicious burgers or a whole bunch of things. However, it does have an Android powered tablet. Earlier this week in Pyongyang, Chosun Computer showed off its new tablet, which seems to be running Android. It's not clear, however, where the tablet is actually made. Google told the WSJ that it's possible the North Korean company is legally using Android, because it's open-source. If Chosun Computers has Google applications and services on the device, then it would be in violation of the company's software. 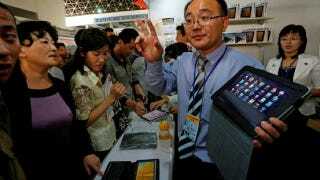 his own Android-powered, North Korean produced tablet. Capitalism!